The reveal of a new chapter in the elaborate "Star Wars" saga may seem commonplace in an age when special effects have been able to discover countless visionary movie worlds, but it is important to remember that the essence of our movie blockbusters today is partially owed to the ambition that set this franchise into motion all those years ago. When the first part of this story was unleashed in the mid-70s, it did more than just excite and marvel those who witnessed the spectacle; it literally awakened a new generation of dreamers, who saw cinema as more than just a tool for mimicking the foreground of our everyday lives. Here, at long last, movies were capable of exploring the universes that were nothing more than just figments in one's imagination on a grand scale. Limits were breached, walls were torn down, and gravity was eradicated from celluloid forever. Not a single person who saw the film could challenge its scope or its animal enthusiasm, and its legacy, further enriched by two equally satisfying follow-up chapters in the forthcoming years, was one that not only endured for future generations but in ways stayed relevant even amongst a slew of equally-ambitious endeavors that filled the theaters in the decades to come. Subsequent revisits to George Lucas' faraway galaxy have not always generated that same level of enthusiasm. 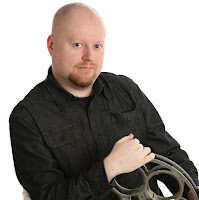 The elasticity of the movie camera has stretched quite reasonably in the twenty-something years since the story made its debut, and modern filmmakers have been able to achieve a level of success in discovering newer worlds that certainly deaden the impact of new discoveries being made in the "Star Wars" universe. Still, this new trilogy of films, started in 1999 with "The Phantom Menace" and now concluded with "Revenge of the Sith," have garnered pleasure in other regards: 1) as prequels to the original trilogy, they create an interesting backdrop for the events of the later stories; 2) they occupy the same visionary scope that catapulted the first three endeavors to such high success; and 3) at the very basic core, they are fun. No one argues that they never quite match the electricity of the earlier releases, naturally, but anyone expecting otherwise was never meant to see such endeavors to begin with. Here is a trilogy that simply wants to add a few lightning strikes to the storm, not try to steal all the thunder. In the new "Star Wars Episode III - Revenge of the Sith," the brain child of a clever sci-fi aficionado draws open the curtain for a final performance that embodies several traits which made the original trilogy so captivating: it is a stimulating, tense and sometimes emotional little space opera, laced with visual nostalgia that garners all kinds of smiles, and scope that adds another token of treasure to an already-realized movie universe. It is also a very interesting endeavor in the way it sifts through two distinct story arcs and then ultimately fuses them together. Prequels by nature are sometimes rather difficult beasts, especially when they are done on a scale as demanding as this one - how does one answer all the questions and offer all the insight of the past without undermining the premise of the future, especially when you revisit the universe so long after your initial trek? Needless to say, Lucas grappled with all the challenges facing him here and has created an ideal, convincing finale for this franchise. The premise, pretty much foreseen ever since the idea of prequels came about, involves a tug-of-war between Jedi and Sith (aka the good and the bad, or the light and the dark) for control of the republic - and, in particular, the talents and power of Anakin Skywalker (Hayden Christensen), who became part of the Jedi council at a young age under the watchful eye of Obi Wan Kenobi (Ewan McGregor). At the start of the film, Kenobi and Skywalker face off with an army of drones to rescue Chancellor Palpatine (Ian McDiarmid), the primary power figure of the republic, who has been kidnapped by the rebellious Count Dooku (Christopher Lee). When Anakin single-handedly overthrows the dark lord and rescues the captured politician, Palpatine rewards him by making him his direct liaison to the Jedi council, a move that does not please any of his peers, especially at a time when the Chancellor's control on the Senate threatens to seemingly overthrow democracy. What many do not know - or, perhaps, are simply too naïve to realize - is that Palpatine is also the leader of the republic's sworn enemy the Sith, the wielders of the force who depend on the dark side in order to fuel their desires. Palpatine's relationship with Skywalker is less about returning favors and more about altering the balance; he secretly hopes he can persuade his new comrade over to the dark side in order to overthrow democracy and create an empire. His weapon: using Anakin's love for the now-pregnant Padmé Amidala (Natalie Portman) as a lure. At the center of this arc and in between various subplots that involve intergalactic battle, assassination attempts and even a visit to the planet of the Wookies (with a cleverly-placed Chewbacca finally making a brief appearance) is a rather interesting study of the deterioration of character. Anakin Skywalker is, of course, the young Jedi apprentice who would one day be destined to become the saga's most important villain, Darth Vader, but not yet having the specifics of that alteration down to knowledge help to elevate "Revenge of the Sith" into much more unique territory. Here we are not necessarily watching just to absorb light-saber duels, words of wisdom from Yoda or elaborate space chases; no, we're partially here to see just how such a drastic transformation can take place in such a short span of time. Exactly what triggers the alteration from cautious Jedi to all-powerful Sith lord? The answer is a simple one, sometimes daring, and yet totally plausible. The moment when Skywalker's breath is pumped through the Vader costume is perhaps the strongest isolated scene in these prequels; nostalgic and yet eerie, it adds a deeper context to our notion of why this character is so important in this universe. If the film does not provide total satisfaction, it is because the energetic and thought-provoking thrust is often restricted by other elements - many of which have plagued this trilogy of prequels right from the beginning. For one, Lucas's screenplay is saddled with dialogue so pedestrian that it comes off like a lesson in basic English; often characters engage in discussions that trickle off into nothingness, and moments of tension that should be heightened by cleverly-devised parley are nullified by statements or announcements that even teachers would be embarrassed to use in beginners speech courses. Furthermore, the performances generated from several of lead stars are so wooden and forced that they often seem more digital than the actual characters generated by special effects. Christensen does a respectable job of handling the difficult transformation of Anakin Skywalker, but his co-star Portman seems completely detached, as if she's just standing there hoping that her fate arrives before she is required to show any genuine connection to her situation. The first prequel in this series, "The Phantom Menace" did not suffer as much from dilemmas like these because it was a movie completely removed from the notion of looking or sounding like it was part of the "Star Wars" universe (several hated the first prequel for such reasons, but I believed, and still do, that it is the strongest and most amusing of the lot). "Attack of the Clones," meanwhile brought those problems to the forefront and was unable to bury them behind any kind of stimulating visual; the movie was so obviously a middle chapter in a trilogy that it was rather discouraging. Here, though, Lucas knows that audiences are not here to listen to smart dialogue or watch credible acting, and as such he doesn't let such factors detract from his true virtues. The special effects are outstanding. 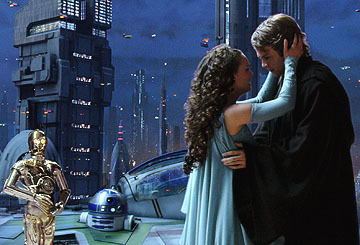 The approach of certain scenes raise the platform of drama into something rather heart-stirring (consider a scene in which Amidala gives birth to Luke and Leah shortly before passing away). And most importantly, the specific details that eventually link the stories of both trilogies have a certain instinctive brilliance to them; it's not as if we're being force-fed back-story here because things happen just as we suspect they would. As a bridge between the old and the new, "Revenge of the Sith" is perhaps the best possible result imaginable, a film that remembers a past, foresees a future and then lives for the moment without being encumbered by a conscious desire to rush around and fill in all of the necessary blanks. Most importantly, however, it reminds us just how many adventures that this series has taken us on over the years - some of them great and some of them bad, the universe of "Star Wars" is now, at last, fully realized, and collectively these films embody the enduring promise of imaginative filmmaking.